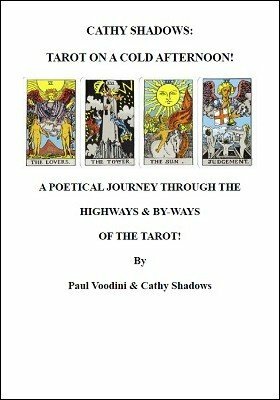 Cathy Shadows: Tarot on a Cold Afternoon is a poetical journey through the Major Arcana of the Tarot, composed by Paul Voodini and inspired by long afternoons spent chatting with his favourite psychic and reader, Cathy Shadows! This is a delightful little ebook, full of whimsy and poetical insight. For the experienced reader it is sure to raise a smile and offer perhaps some new insights. For the newcomer to the Tarot, it will open the eyes to the poetry and beauty of these much-misunderstood cards. Each of the 22 cards of the Major Arcana are examined, and although this PDF will not teach you the mechanics of how to do a reading, it will help you to understand the underlying poetry and insights provided by each card in the Major Arcana. Priced at just $1, this 25 page PDF is fully illustrated throughout and will be a wonderful addition to any collection of Tarot-based literature.